Note: CHINA BLUE can also be purchased for personal use only and for use by activist groups and religious organizations. Send your request for pricing information to chinablue@bullfrogfilms.com or call us at (800) 543-3764. 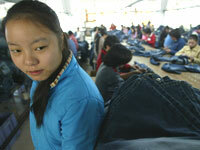 Like no other film before, China Blue is a powerful and poignant journey into the harsh world of sweatshop workers. Shot clandestinely, this is a deep-access account of what both China and the international retailers don't want us to see: how the clothes we buy are actually made. Following a pair of denim jeans from birth to sale, China Blue links the power of the U.S. consumer market to the daily lives of a Chinese factory owner and two teenaged female factory workers. Filmed both in the factory and in the workers' faraway village, this documentary provides a rare, human glimpse at China's rapid transformation into a free market society. China Blue is the second film in Micha X. Peled's Globalization Trilogy. Store Wars: When Wal-Mart Comes to Town focuses on consumption in the U.S., and China Blue investigates the manufacturing of the clothes we all consume. Bitter Seeds looks at the raw materials. It goes to India and follows the farmers growing the cotton exported to China's garment factories to be used for the clothes sold in the West. Each film explores a deeper layer of the production-consumption chain. "China Blue offers an illuminating window onto the normally hidden worlds of global production. It provides unparalleled access to the everyday lives of garment workers in China, giving them voice, and giving a face to the reality underlying China's emergence as the factory floor to the world. For those interested in globalization, economic development, or current controversies around sweatshops, China Blue is an excellent introduction to the experiences of workers from developing countries - even those supposedly 'winning' through globalization." "For those who are interested in women's labor and its social and political implications within a broader framework of economic globalization, [the film] provide[s] a good grip on the topic." "Anyone who watches this movie...cannot help but gain some greater insight into what 'holism' and 'globalization' mean in the modern world. Not only are other aspects of Chinese society changing as it's economy changes...but the changes in China are being felt in the West and vice versa...Hopefully, American viewers of this film will think more critically about the jeans they wear, their own industrial history, the phenomenon of globalization, and the human cost of providing goods at ever-lower prices." "This eye-opening documentary will have particular value for students of sociology, Asian studies, and economics. Jasmine's plight can serve as an excellent springboard for discussions about women's and worker's rights and the economic responsibility of American consumers." "China Blue is a revealing and quite moving inside look at China's emerging capitalist system that should make Western viewers think twice about the human cost of buying apparel with 'made in China' labels. Recommended." "We may know that our jeans are made in sweatshops in China, but this poignant and well-documented film makes us see the whole picture...[China Blue] should be seen by all audiences. Highly Recommended." "Does an excellent job of illustrating the 'human face' of globalization, and specifically the often-concealed linkages between people at different ends of a commodity chain...Teachers interested in discussing how commodity chains work in practice will make their task much easier, and more relevant to students, by showing China Blue...Suitable for both the university and high school classroom; since the film's central characters are teenagers, high school students can especially relate to the story and are likely to be captivated by the differences between their own lives and the difficult lives depicted in China Blue." "A twenty-first century version of sweatshops, this is more than just the plight of three young women who work and live in the blue jeans factory. It is about the impact of the consumer market upon the lives of people across the globe. Recommended for high school students and other consumers who have a social conscience." "China Blue is more than an exercise in cinematic activism...the film develops a natural dramatic structure that's profoundly affecting. Mr. Peled doesn't just record the girl's indignities, he listens to their dreams...China Blue examines the plight of the world's largest pool of cheap labor and traces its exploitation to a retail outlet near you." "Heartbreaking, moving...This is an unforgettable film." "Micha X. Peled's marvelous documentary about the young women who work in a Chinese jeans factory is an empathetic and revealing study. With probing access and a level of detail similar films have failed to obtain, the film doesn't just describe the tough working conditions of these factories - it draws vigorous, charming portraits of the women who work there. This is one of the best of many recent documentaries about globalization." "Heartbreaking yet boldly essential...fairly balanced and richly human." "Compelling...gives the phrase 'sweatshop' a whole different perspective." "The tacit fury of China Blue." "What if, when you stuck your hand into the pocket of a new pair of brand-name jeans, you pulled out a letter from one of the exploited workers who had slaved and sweated over your denim? Would you be surprised if the writer acted more curious than angry? Would you chuckle when she wondered why you need such tall, wide pants? That's the experience of watching China Blue...Refreshing." "A riveting documentary...A heart-wrenching story of the exploitation of young optimism and energy by...the desire for profit. See it before you head off to the mall for that clothing sale." "Intimate and rigorously detailed...remarkable level of access and the complex portrait of globalization as an intractable beast that relies on consumer complicity in viewing foreign laborers as subhuman." "Eye opening...[filmmaker] Peled was harassed at every turn by Chinese officials, but he managed to get this shocking film made. That's just one reason China Blue is worthy of praise." "Surprisingly fair-minded...it gives its heart and soul to the girls." "There's a terrible irony to the designer jeans uniformly worn by teenage laborers featured in China Blue, Micha X. Peled's meticulously livid exposé of a sweatshop in Southern China." "Bay Area documentarian Micha X. Peled got unprecedented access to a blue jeans factory...It's a vérité portrait of adolescents who are instantly recognizable, though their sweatshop environs strike us as nearly unendurable." "Pic's degree of access and intimacy is surprising, even more so when closing intertitles reveal Chinese authorities did try to shut down the filmmakers several times...Engaging in character and narrative terms...Much of China Blue is charming, because its subjects are...Micha Peled's docu China Blue makes a stronger case against worker exploitation than any news item could." "An intimate and eye-opening look into the personal lives of sweatshop workers...The film is an unflinching indictment of globalization." "It is difficult, but necessary, to watch China Blue. For those who take shopping for consumer goods for granted...this behind-the-scenes look at how one popular item is produced will leave you chilled...China Blue is a must-see." "China Blue can burst through the typical abstract depiction of this problem in order to confront its human dimension. It's a shocking experience." "Without (Chinese) government knowledge or approval, San Francisco filmmaker Micha X. Peled shot a stunningly candid portrait of the lively teenagers who make blue jeans." "Commendable in its fair depiction of the problems faced by the textile industry." "It may be the Year of the Pig in the Chinese calendar, but there ought to be some recognition of the Year of the Bullfrog in honor of Bullfrog Films...Bullfrog has a real treasure in China Blue...This is where Western manufacturing jobs have fled, dear Wal-Mart shoppers, and here are the peasants that big-business advocates claim are uplifted by globalization...See China Blue, any way you can, in this aptly named Year of the Pig." "A compelling film that lets us live inside the world of the people - mainly young Chinese women - who make the majority of the jeans we all wear every day...The mere fact that likely every single person benefits from the labor and minimal salaries of these women makes the film important for all to see, especially teenagers." "Micha X. Peled knows that if the world is connected by some common thread, that thread is being stitched by an underpaid worker in a sweatshop in a hemisphere away...China Blue [is] an intimate and eye-opening look into the personal lives of sweatshop workers." "There's a terrible irony...to the designer jeans uniformly worn by the teenage laborers featured in China Blue, Micha X. Peled's meticulously livid expose of a sweatshop in southern China." "Micha X. Peled's documentary is shockingly thorough...and highly provoking...It may be close to impossible to mandate responsible capitalism, but China Blue shows us exactly what's at stake." "China Blue is...designed to make Westerners face the fact that their relatively high standard of living comes at the expense of the virtually-enslaved indigenous peoples of the Third World...Excellent (4 stars)." "[A film] you'll kick yourself for missing...[China Blue] will haunt your future shopping trips, which is actually a good thing." "China Blue is a gut check for anyone who doesn't know about labor conditions inside China...Thinking about the consequences of our consumer choices isn't easy, but Peled's story of Chinese factory workers makes us confront the connection between our cheap goods and their toil." "Eye-opening, infuriating -- and heartbreaking...China Blue asks us to look hard, without the intercession of cheery marketing and attractive prices: These are the exploited children behind the clothes we buy, wear and discard so cavalierly." "China Blue exposes the hard truth of physical labor in our modern world of worker's rights and progress." "Enough to make you feel more than a little guilty every time you put on a pair of jeans...But, more importantly, it focuses on an issue - workers' rights and the need for fair pay - that is overlooked in go-go-go globalism with heart and intensity." "No matter where your denim was cut, stitched, and stone-washed, you owe it to your conscience to view China Blue, a documentary that will make you squirm out of your pants." "[China Blue] emerges as a charming character study heavily laced with strong damnations rather than grating with the activist agitprop stylings that so often cloud well-meaning tales of sorrow." "There's a new breed of documentary film that is trying to tear down the distance between what you own and the lives of the people who made it for you and China Blue...does so with considerable warmth." "Peled captures the delicate balance between workers, retailers, and consumers...A powerful examination of the hidden costs behind every bargain." "If you need a good argument to look for a MADE IN USA label on your next clothes purchase, see China Blue for a sobering economic lesson." "The rapid growth of China's economy is often noted, but rarely are the personal stories of the workers who fuel it...[China Blue] poignantly reveals the human price we pay for 'cheap' labor." "This sweet yet heartbreaking documentary about the young Chinese girls who make blue jeans is the kind of film Bullfrog [Films] embraces. It has the power to change the world...A daring, compassionate documentary." "China Blue is a compelling and important documentary. A must see for anyone interested in the appalling conditions in Chinese factories. This is one of the rare films that attracts the general public as well as serves as an effective educational tool. It has been very valuable in my campaigning on human rights and consumer issues. I cannot recommend it highly enough." Includes additional scenes, study guide, factory promo film, Q & A with the director, photo gallery, links to activist organizations. "China Blue presents a powerful testimony of the working conditions in China as well as moving and sensitive portraits of the young workers to whom we owe our 'Made in China' jeans." "Like some of Micha X. Peled's previous films (Store Wars, Inside God's Bunker), China Blue is primarily a deep-access film." "Mr. Peled has achieved some amazing footage of life in the factory...If you were ever curious about the people who make your blue jeans, China Blue is the film for you." "At least one woman rushed home to rip up her blue jeans...The measure of a successful big screen documentary is not the facts that it shows us - but how much it make us want to engage with the facts." "Cleverly constructed and ultimately heart-wrenching...Multi-layered film explores the personalities, aspirations and imaginations of the main characters with sensitivity and tact...Director Micha X. Peled calls into question the whole system of global free trade and points at the responsibility retailers and ourselves - the consumer - all share. In the words of Jasmine: 'Who are the fat, tall people who buy these jeans we make?'" "One of the hottest titles at IDFA this year...Go, see and feel guilty about being a rich European. You know you want to." "Shines a light on the inhumane working conditions...Will stay with you." "Director Micha Peled, whose film Store Wars featured at the Festival in 2002, continues his information campaign against America's massive Wal-Mart chain by taking a very close look at who is manufacturing their jeans." "Sixteen-year-old Jasmine is a thread-cutter at the Lifeng Factory, one of dozens of denim manufacturers in Shaxi, South China. As she puts it, she makes the 'big and fat' jeans we wear. Like her new friends at the factory - Liping, a seamstress, and Orchid, a zipper installer - Jasmine is one of hundreds of millions of people, mostly young women, who make up the largest pool of cheap labor in the world...Shot clandestinely, China Blue paints a nuanced, thorough and ultimately moving portrait of the daily lives of the anonymous young workers who make our clothes...[while also] illuminat[ing] the economic pressures applied by Western companies and their human consequences...Contrary to the notion that these girls offer a pliant, obedient work force, the film reveals glimpses of an emerging activism: a bold willingness, as Jasmine asserts, 'to pull the Tiger's whiskers.' Coming into a sense of self-worth, Jasmine sends a gentle message to the West in the pocket of a pair of jeans. Tempering the giddy, greedy imperatives of the market, China Blue offers remarkable access into the other new China." "China Blue...presents a revealing look into the daily lives of teenage girls who work long (often unpaid) hours...How must does a pair of jeans really cost? It's clear that costs involved in producing one pair of jeans ought not be measured in mere currency." "Film director Micha Peled hopes shopping will never be the same again for people who see his new film, China Blue." "Once you see China Blue you may never want to but another pair of Levi's or jeans again...What [the filmmakers] developed is a documentary that takes the viewer, by the hand, into the lives of exploited workers." "China Blue is instructive, fascinating and a sad commentary on the economic times. At age 14 or 16, teens in America are cruising the mall looking for jeans. At 14 or 16, teens in China are making them and dreaming about who will be wearing them on the other side of the world."